2 Feet Of Rain Causes Massive Flooding In Florida, Alabama : The Two-Way The record rainfall in some areas comes close on the heels of dozens of tornadoes that killed dozens of people across a swath of the country earlier this week. 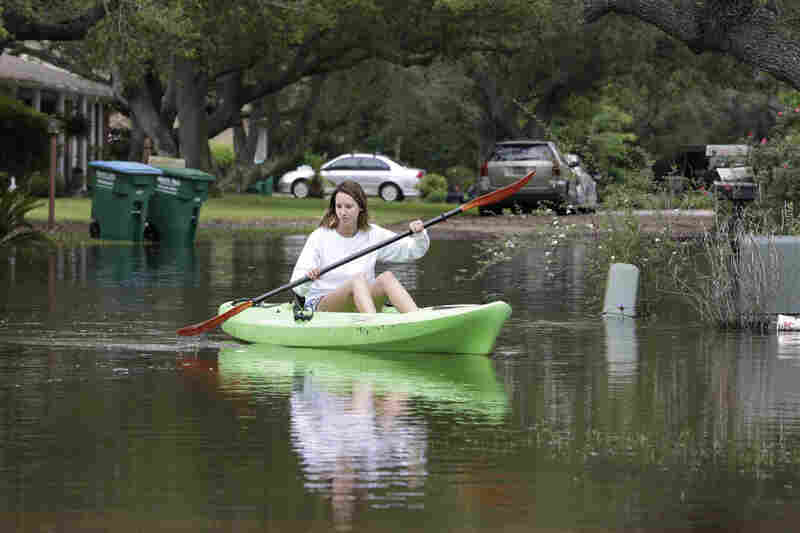 Chelsea Owens navigates a kayak down a flooded street near her home in Gulf Breeze, Fla., on Thursday. Much of the East and parts of the South have been hit by torrential rains. Florida's Panhandle and southern Alabama, for example, got about 2 feet of rain in 24 hours. 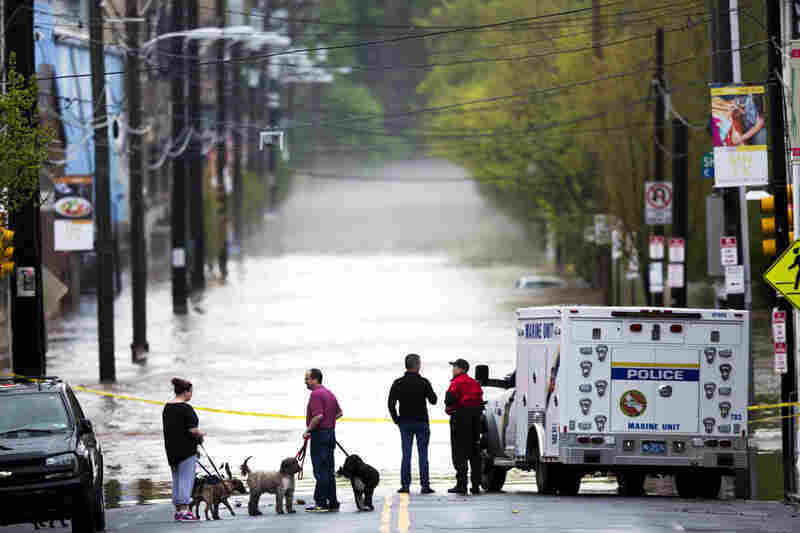 People gather to view floodwaters from the Schuylkill River in Philadelphia. Flood warnings Thursday stretched from Mississippi to Massachusetts. 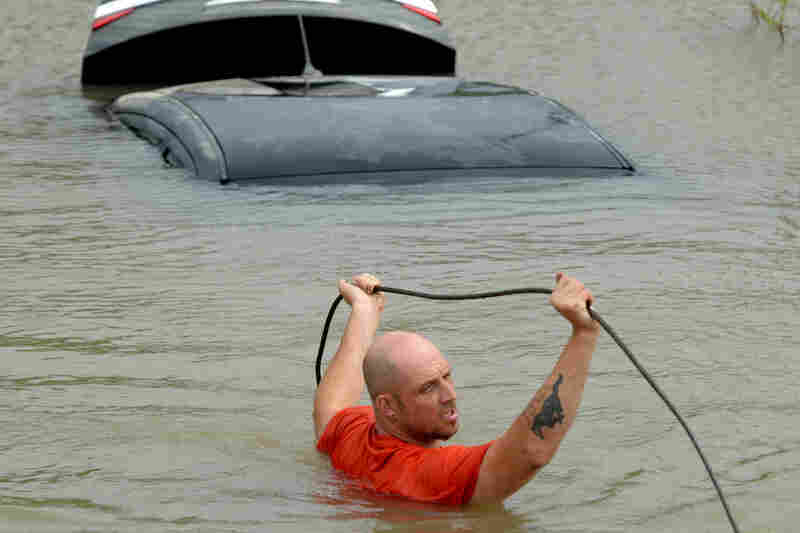 Michael Harrell of J&J Towing attaches a tow cable to a car that was swept off the road by torrential rains in Pensacola, Fla.
Winnie Bunting is carried to an ambulance after being rescued from her flooded home in Pensacola. 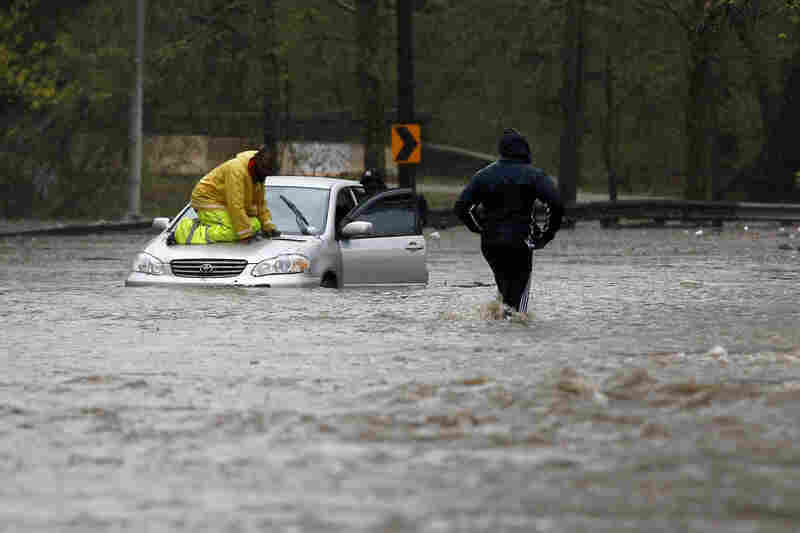 A man walks across a flooded section of Cobbs Creek Parkway as a tow truck worker tries to free a swamped car in Philadelphia. 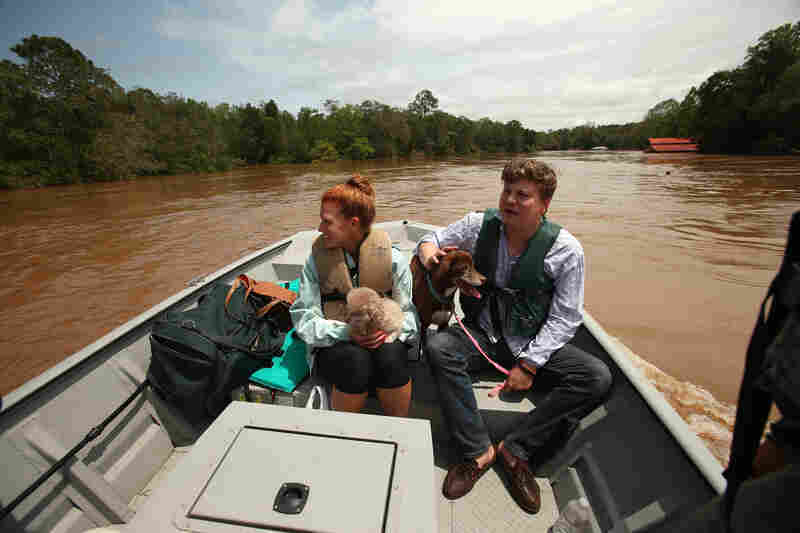 In Fairhope, Ala., Marine Police rescued Sarah and Hunter Anderson and their two dogs from their home on the Fish River, which has swelled to historic levels. 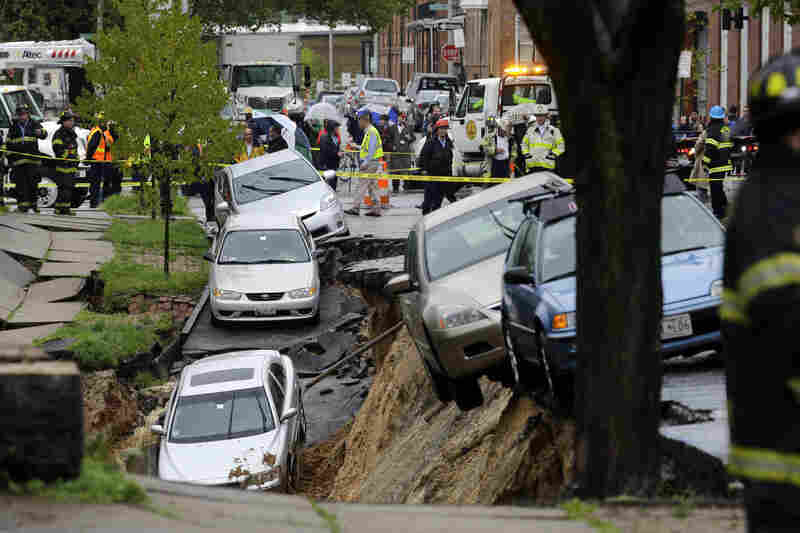 Cars teetered precariously in Baltimore after heavy rain caused a retaining wall to fail. Other vehicles were sent tumbling onto train tracks below. 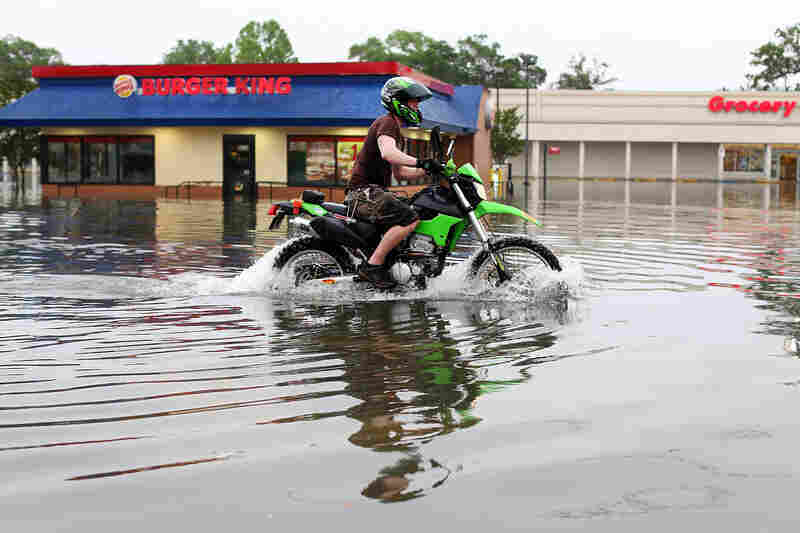 A man rode a motorcycle on a flooded street in Pensacola. Wednesday marked the single rainiest day ever recorded in the city. Extreme rainfall in much of the East and parts of the South is causing major problems, with Florida's Panhandle and southern Alabama — which got more than 2 feet of rain in 24 hours — bearing the brunt of the onslaught. The torrential rains followed close on the heels of a rash of deadly tornadoes that battered a broad swath of the country earlier this week, killing dozens of people. Flood warnings for today stretch from Massachusetts to the Carolinas, Georgia, Florida, Alabama and Mississippi. The Associated Press says the system is expected to bring heavy rain and thunderstorms to the Mid-Atlantic and Northeast regions. 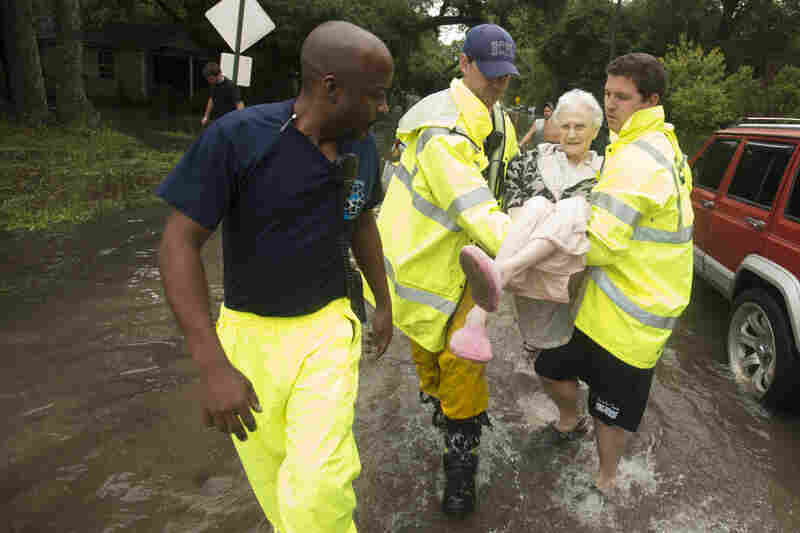 In Pensacola, Fla., it was the single rainiest day ever recorded, and people climbed to rooftops or into attics to escape the rising floodwaters. NPR's Debbie Elliot says Pensacola's high bluffs over the bay undermined the busy scenic highway there. "Scores of motorists were stranded as water gushed over roads," she reports on Morning Edition. "At least one person was killed on a flooded roadway. Some homes are now flooded out, and entire neighborhoods are unnavigable. Boats have floated away from docks and are making landfall elsewhere." The cause of an apparent gas explosion at a Pensacola jail that killed at least two inmates and injured dozens of others has yet to be determined, but the severe weather and flooding could be a factor. "Kitzel said he awoke about 6 a.m on Wednesday to find a foot of water in parts of his family's house near Fairpoint Drive." Bob Barrett of NPR member station WUWF reports that in the Pensacola suburb of Gulf Breeze, officials "are still trying to access the situation and find people who need help." "All Gulf Breeze police and fire officers have been called into work, helping with traffic control and taking care of any emergencies," Barrett said. "Some elderly and disabled residents needed help leaving their homes." In Alabama, the National Weather Service in Mobile "is estimating that up to 26 inches of rain fell in an area around the Alabama-Florida state line Tuesday and Wednesday. It was the fifth-wettest day in 143 years for the city, according to The Weather Channel. The NWS says 22 inches to 26 inches of rain fell over Perdido Bay, Wolf Bay, Foley and Orange Beach. AL.com reports: "The Salvation Army will be out in Baldwin County Thursday. There are two feeding units and a disaster team in the southern part of the county. The mobile kitchens will make their way from Gulf Shores to Foley and back to Fish River, according to a spokeswoman for the Salvation Army." In Maryland, state officials are helping to evacuate hundreds of residents of a senior apartment complex in the city of Laurel after rising water levels behind a nearby dam caused water to spill through a gap in the structure. Officials have been forced to open all seven flood gates. And in Baltimore, rain is being blamed for a street collapse after a retaining wall failed, sending several parked cars tumbling onto train tracks below.